A tree’s future lies in its roots. Roots that are shaped over many years by the constant search and struggle for sustenance. It’s not about how tall the tree is—nor is it about the number of branches it has, the size of its leaves, or the beauty of its blossoms. The tree’s roots give it the ability to endure droughts and weather storms, but most of all — when the conditions are right — its roots allow the tree to offer the sweetest of fruit. If I were a tree, I think I would be a baobab. The baobab is not a pretty tree, but if you wandered upon one in the arid African bushland or the Australian outback, you would be glad to see it for the water, food, medicine, and shelter it would offer you. You might also be reassured by markings on the tree it has long held the company of humans for shelter and for special occasions. Looking around, you would notice that the baobab isn’t in close company of many other baobabs. There may be a few nearby, but you will never find a forest of baobabs. As a friend, the baobab plays home to an eclectic assortment of birds, bats, reptiles, and insects, and it graciously hosts baboons and warthogs — or in Australia, kangaroos, wallabies, and camels—who drop by to dine on its seedpods. The baobab’s success lies in its ability to endure conditions other trees cannot, but life for a baobab is never easy. The dry and the wet each bring their own struggle for the baobab. In their thirst for the baobab’s moist bark, the biggest of animals — the elephant — may condemn it to a slow death. And when it’s wet, the smallest of spores — the black fungus — can infect its bark with lethal consequences. 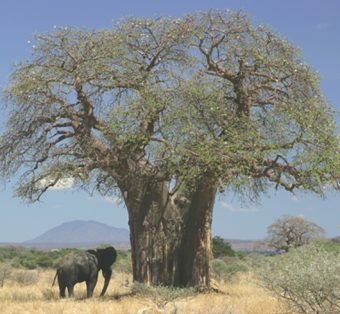 Unlike to many other trees, humans have posed little threat to the baobab over the centuries. The baobab’s spongy bark and soft fiber make it impervious to axes in search of wood. Instead, often centuries-old, baobabs have been regarded as sacred—places where a people’s stories and memories are passed down the generations. That the baobab is so unlike so many trees makes it an outsider (like me), but its proudly unique appearance and way of life is, for me, beautiful and noble. If I were to become a tree, I would want to become a sessile oak. Like me, it has a hard time growing surrounded by other trees, oftentimes getting literally choked by the faster growing beeches. It grows best in solitude, or in company of a few fellow sessile oaks, becoming one of the most useful and admired of the trees. That’s the tree I look like most. I loved answering this question as I work (and am fascinated by) forestry. Thanks.